Global interest in all things Africa continues to grow thanks in part to dedicated exhibitions and events that help to introduce the continent’s diverse offerings to new audiences. In the UK Pop Up Africa is one such series of events, usually comprising a mix of vibrant market and delectable food stalls, and where we had the opportunity to showcase Shoko Press books at one of their events over the summer. Events like these take a lot of behind the scenes planning, hard work, and passion. And to find out more we caught up with Pop Up Africa founder Jessica Laditan to get an insider view. 1. Please introduce yourself, your background, where you are based and tell us a bit about Pop Up Africa? I’m Jessica Laditan, mother of 2 and the Founder & Creative Director of Pop Up Africa. I studied Marketing at University and prior to forming Pop Up Africa, worked in Fashion PR before moving into Project Management, managing and coordinating a range of youth initiatives for various youth organisations in partnership with media companies such as Channel 4, BBC, Timeout, and ITV. I’m passionate about development in Africa and the growth of its creative scene, retail and food industries. Pop Up Africa is a UK based Africa focused pop up events company. We curate and run creative projects and retail events across iconic spaces in the UK and Sub- Saharan Africa. Pop Up Africa wants to see more African brands in the mainstream market, empower African creatives and entrepreneurs as well as encourage cross broader partnerships. Pop Up Africa events and services vary from trade events to creative cultural festivals, panel discussions, networking seminars and training. Pop Up Africa was formed out of my desire to make African brands more available on the international market. 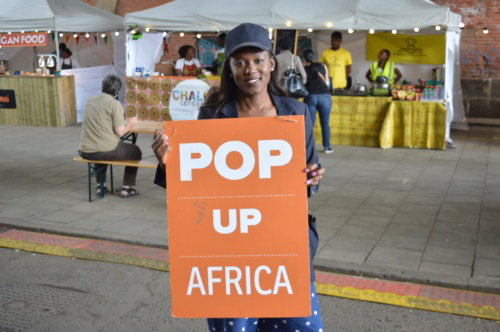 Since it’s launch in 2013 Pop Up Africa has seen stall holders take their brand from pop up stalls to the shelves of well-known stores, including Tesco and Selfridges. In 2016 I was a judge for the ‘Next Big Star in African Food’ a competition put together by Red Magazine and Harper Collins Publishers. Other Pop Up Africa press features include BBC Africa, Time Out magazine, The Evening Standard Online and Arik Air’s in-flight magazine, Wings. 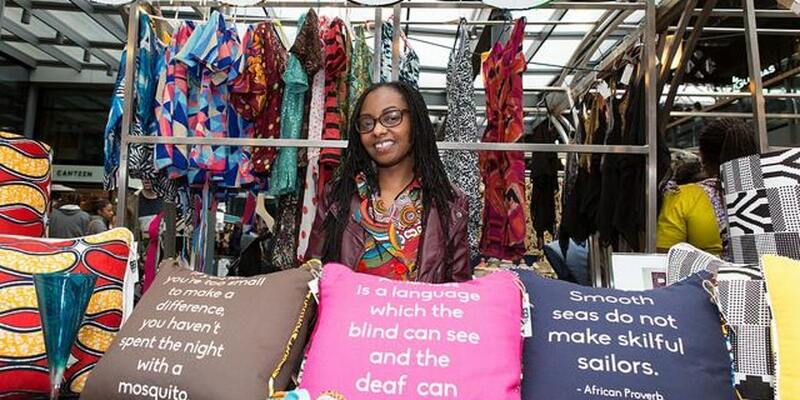 We have worked in partnership with brands such as Facebook, The British Council, The Southbank Centre and Spitalfields E1 to put on events to showcase the best in African arts, products, and food to the international market. 2. What prompted the idea of starting Pop Up Africa, how has it developed over the years, and what has been the impact on the London/UK cultural scene? I was inspired by a trip back home to Nigeria, where I went to a retail event for local makers who didn’t quite have enough money to rent or buy their own shop and whose products didn’t quite fit with the traditional markets but still needed a physical platform to sell their goods. This gave me the idea of creating something similar for African makers in the UK and as soon as I had the idea, I decided to run with it. I had just returned to work from maternity leave with my son and although the idea started out of a passion and general interest I loved the thought of creating something that could grow and eventually enable me to run a business from home full-time so that motivated me. Over the years the business has grown from not only hosting events in the UK but also hosting events across Africa too, connecting diaspora creatives and business owners to those back home. 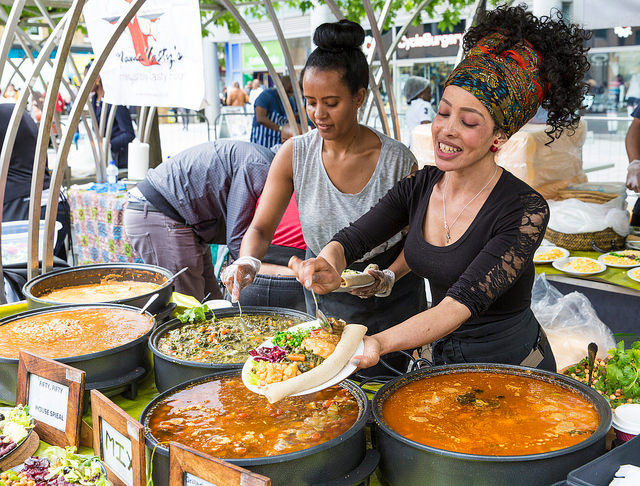 Since starting we have definitely seen a growth in the number of vendors, particularly African food vendors and a general boost in the whole ‘Afro-Brit’ movement, the fusion of cultures influencing products, food, design, fashion, music and so forth. 3. What do you think is fuelling the growing interest in all things Africa, and why are initiatives such as Pop Up Africa growing in popularity? I would say that the African community itself is fueling the growth in interest in all things Africa. We are proud of our heritage and social media platforms have enabled us to showcase the beauty of Africa for ourselves. The growth in interest for all things Africa has meant that the demand for initiatives such as Pop Up Africa has grown. Outside of the online space, we as an African community need physical platforms to be able to showcase our arts, products, and food. 4. Running events certainly takes a lot of time and energy, what have you found to be the most rewarding and the most challenging parts of your work? I love what I do so much and feel blessed to be able to do it but yes it does take up a lot of time and energy! The most rewarding part of what I do is when I see a genuine growth in the brands that I have worked with from being on one of our stalls to being on the shelves of major supermarkets or showcasing to wider audiences. My proudest business moment to date was being invited by Facebook to plan and co-host an event for makers and digital influencers in Dakar, Senegal, which was a platform for the likes of Facebook’s Chris Cox to understand their users in West Africa and how they use social media to promote their business and African culture to a wider audience. The most challenging part is when on the odd occasion the footfall is not as busy as you would have liked it to be, as I always set out to give our traders as big an audience as possible for their brand to get wide reach and big level of exposure. 5. What do you look for in the retailers/creatives you select to participate at your events and why? I look for variety. I like to give very new business’ the opportunity to test the market and at the same time it’s nice for them to be amongst others who are further down the line in their business journey so that the newer business’ can network and learn from them. I don’t like to have too much of the same products or creative skills represented at one event, I’m always excited when I discover something new. This year we had a food stall selling Malagasy food and I was thrilled as I’d never had Malagasy food before. Africa is so vast so it’s important to show that through our events. 6. What advice do you have for those; especially entrepreneurs and start-up brands, who are thinking about taking part in an event like Pop Up Africa but not sure how to prepare, what are the common mistakes to avoid? You can never be over prepared so if there’s anything that you’re unsure of please ask the organisers ahead of the event. I know that this sounds basic but seriously I have traders ask me questions as they arrive on the morning of the event that have either already been answered in emails ahead of the event and not been read or really should have been asked ahead of the event. Also, being at these events is not always about the sales that you make on the day but also about the exposure. My pet hate is when traders don’t come fully loaded with information on how people can get in touch or find them after the event. Another thing to remember is that first impressions and presentation count, I’d advise brands to think about what impression they want people to have of their brand and how they want this to be reflected in their stall presentation on the day.